I should’ve left on Sunday, but I just couldn’t bring myself to drive after a long day on Saturday “Darting” with rando-pals from Davis to Berkeley. I pack everything I need and depart on Monday for a rando-drive of 12 hours to Kanab, Utah to ride the Red Rocks 600k. 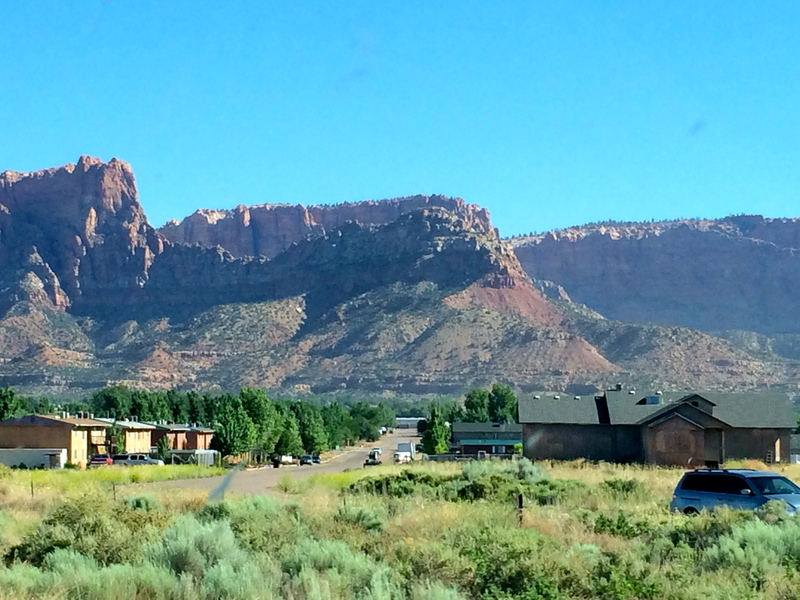 Approaching Kanab, Utah. 12 hr drive from Sacramento. I meet Richard Stum and Jim Haley there. Richard is the RBA for the Utah Rando group and a fellow friend in the bike industry (eogear.com). Jim was an early customer of Rivet, although this was my first time meeting him. Both are over 6’ tall and strong riders. All of us have raced and completed Lotoja (although only one of us has won their age group… so what if there were only 6 people in my category? ), and between us we have close to twenty completed 1200’s. No newbies in this group. 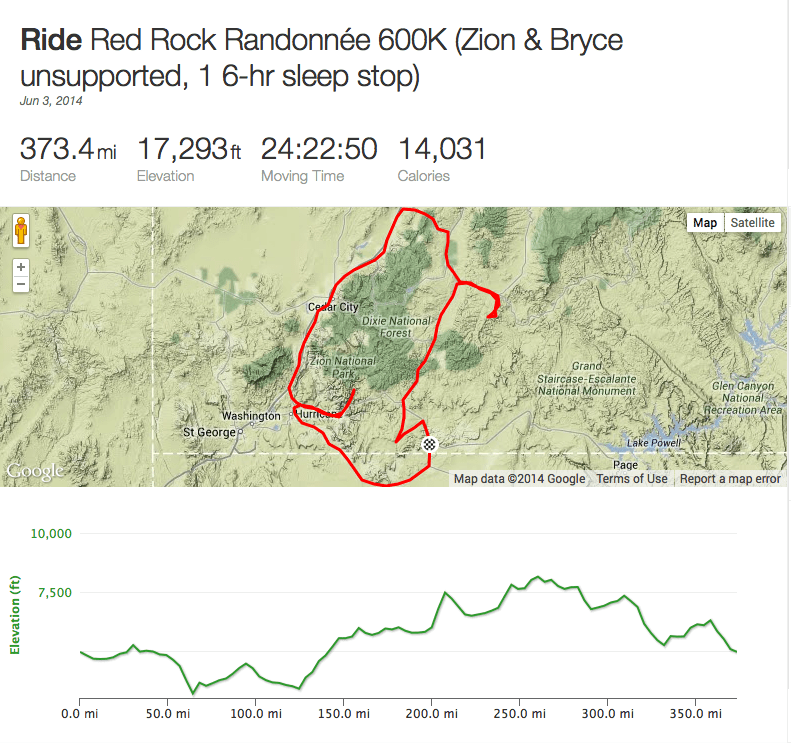 The plan: to do the inaugural Red Rocks 600k brevet. Another rando-pal was going to join us, but she couldn’t swing the scheduling so we are a trio. 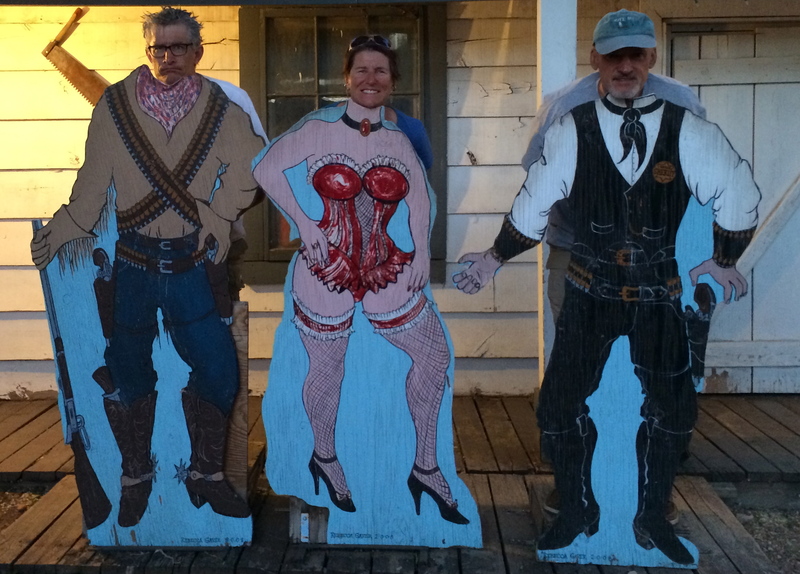 I was nervous about being the slowest – both Jim and Richard are strong riders and larger than me, and I always wonder if I can hang. We’d stick together for the ride, so I wasn’t afraid of being lost, but more concerned about slowing everyone down. 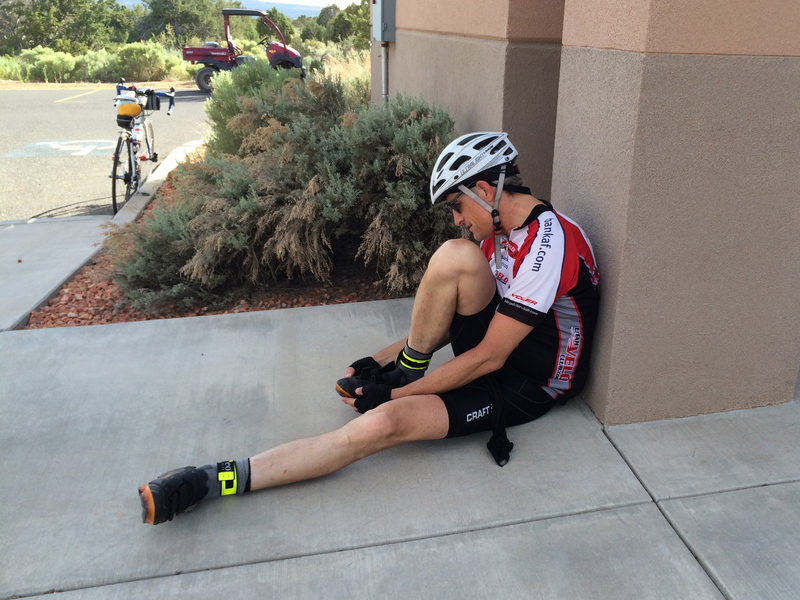 Typical pre-ride jitters. 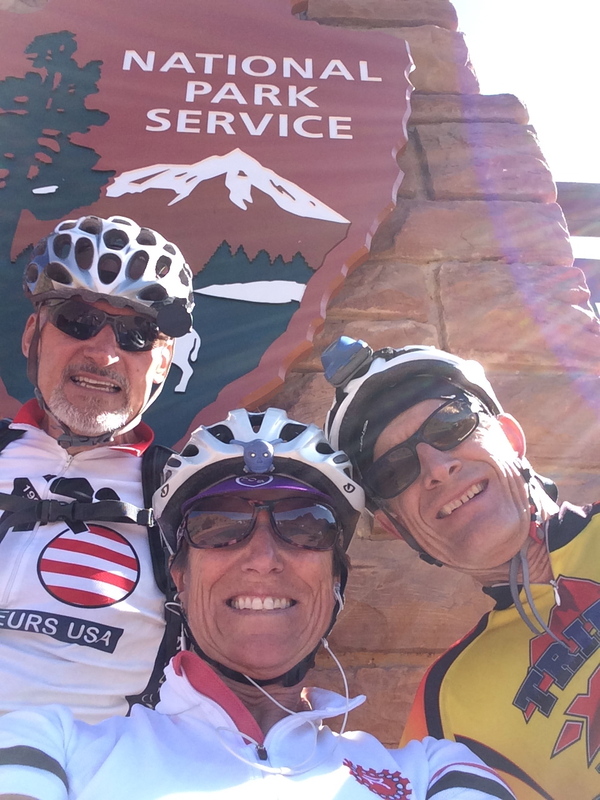 The ride starts in Kanab, and goes over to Hurricane, which is known as the Gateway to the National Parks, and then in and out of Zion NP. The route heads north after that and makes a turn over a pass and heads into the valley where Panquitch is, our first night’s stop. 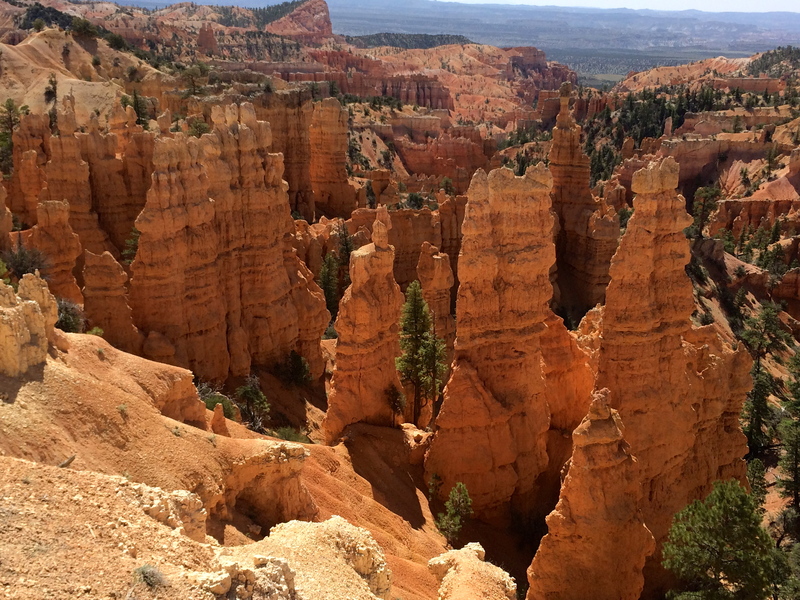 On Day 2 we make an excursion into Bryce NP and then head over to Highway 89 back towards Kanab, with a detour out to the Coral Pink Sands State Park. 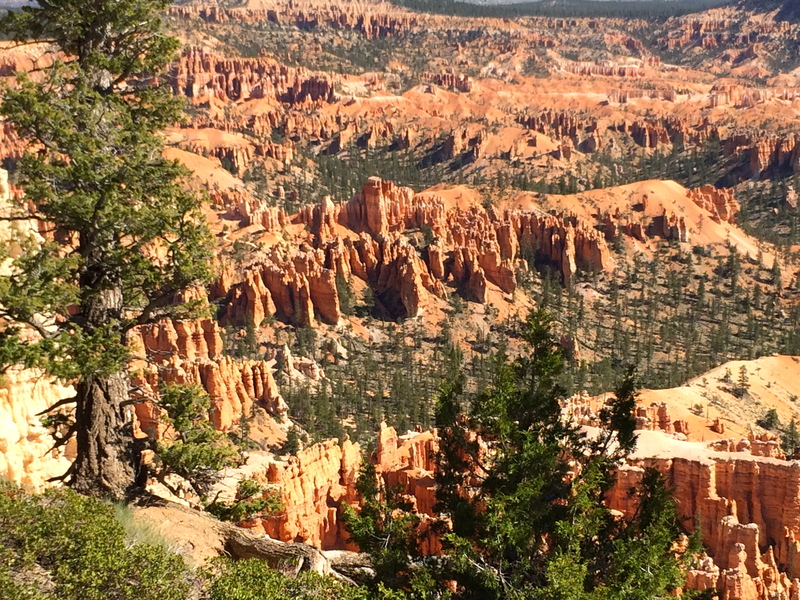 Southern Utah is one of the richest areas in our nation for beauty. 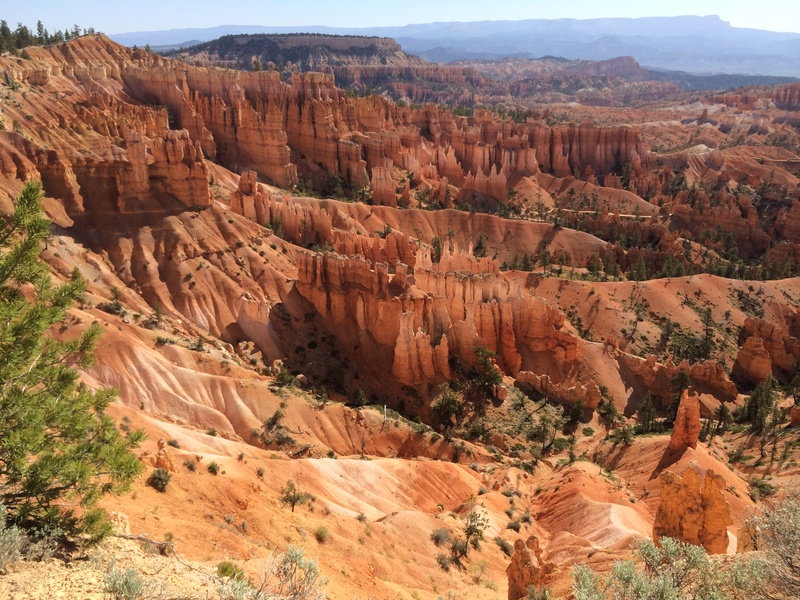 Boasting five National Parks (Arches, Bryce, Canyonlands, Capital Reef & Zion), and countless state parks, it’s the motherlode of canyon country. And the Grand Canyon is less than 80 miles south. Needless to say, it’s visually stunning. Richard’s idea for routing both the 600k and the 1200k is to maximize the beauty of the land, but there’s only one challenge, well, two. The first is that most of these natural wonders are at the top of a plateau, which means there’s climbing involved. A lot of climbing. The second challenge is that Utah is desert. Which means temps can be extreme, and it’s arid. As in, oh-my-god-I-can’t-get-enough-moisture-in-my-mouth-to-swallow dry. 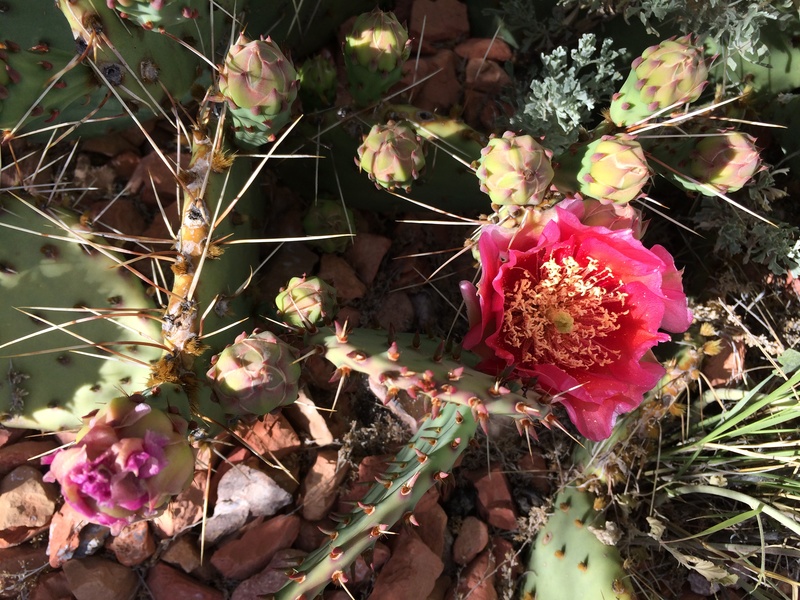 I reach Kanab around 8:00 pm – I had forgotten about the time change – and lost an hour. Richard joins me for a quick bite; Jim has already gone off to bed. We will depart at 4:00 AM. I’m not used to leaving at such an early hour, but I think it will be hot and windy, and so making some time in the dark is OK by me. Up at 3:00, Jim has run over to the C-Store (convenience store) and brought back coffee for us. It goes down as I wake up and we depart on time. It’s dark and warm – 75 degrees! All systems are go. And for me that’s amazing. It means that my Garmin charged correctly, is on the right setting for this course, (which I successfully uploaded while still in Sacramento), and that I remembered to hit the Start button to activate the damn thing. It also means that all batteries are charged and running, and that my bike is working well. I am happy as we make our way in the dark down the road towards Hurricane. The road to Hurricane dips in and out of Arizona. As the sun rises we ride by Colorado City, AZ. This is polygamy country (home of Warren Jeffs) and it gives me the serious creeps. There are very large – almost motel sized – buildings that are individual family compounds. I spot a minivan with a decal on the rear window depicting the happy family with 10 children spread across the window. I do not see a van with multiple wives depicted on it. When we pass by the Merry Wives Café, I speed up a bit. Jim comes up from behind me and tells me I have nothing to fear, “You’re not 14, you’ll be ok.” Onward. In Hurricane we turn right and start to make our way up to Zion NP. The road is wide and winds around a large sandstone outcrop. Up to Springdale we go and finally head into the park proper. 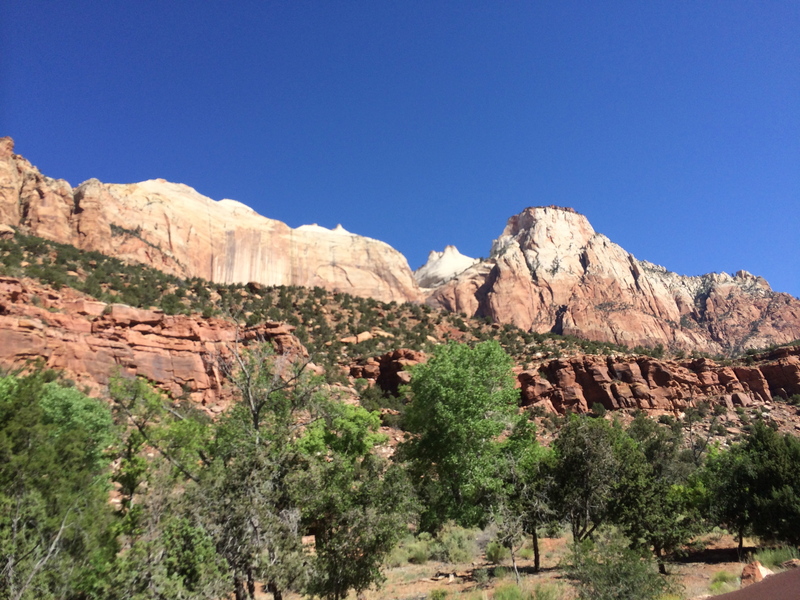 The primary colors in sharp contrast make everything pop: bright bluebird sky against red and white sandstone. Add in the green of the junipers and sage and you get mouth-dropping beauty… for miles. We three at Zion NP. The road is closed to cars, but tour buses pass us every few minutes. By and large, the road is ours. 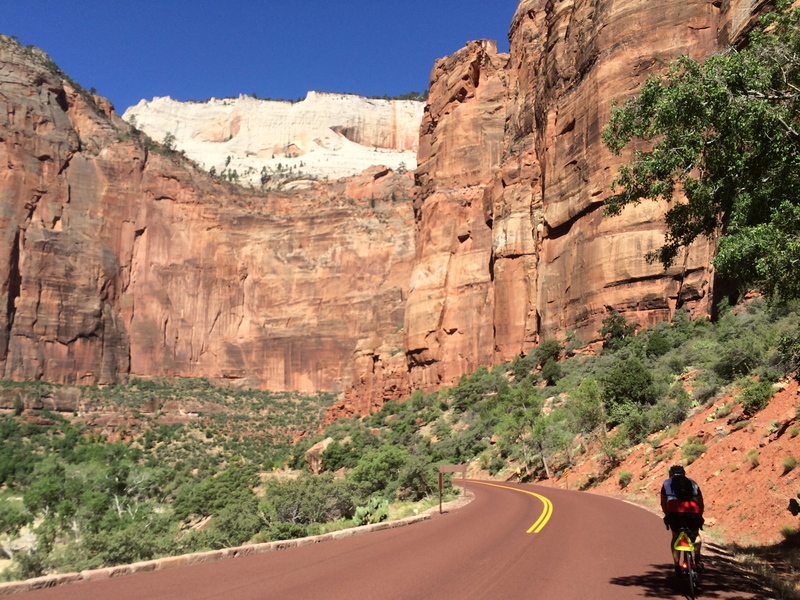 We ride by Weeping Rock, the Patriarchs and Angels Landing. We mosey up to the roads end, a turnaround at the Temple of Sinawava, and stop to fill water bottles and chat with a couple of cyclists from New Jersey who are “gypsying”. They are well into their upper 70’s and are currently homeless – a daughter lives in the Pacific Northwest. 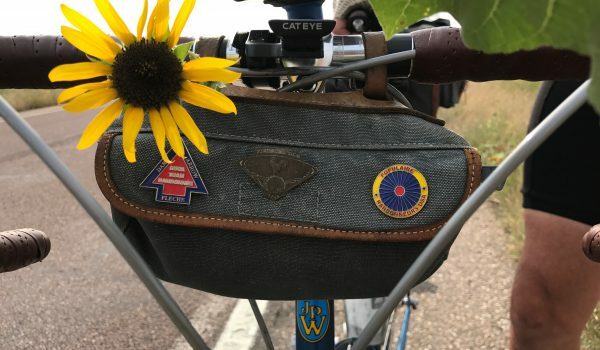 They are exploring the west by bicycle and camper and will make their way up to Portland later in the summer. They’ve been at it for 2 years. I hope to be in their shoes when I’m their age! Heading up the road – no cars! 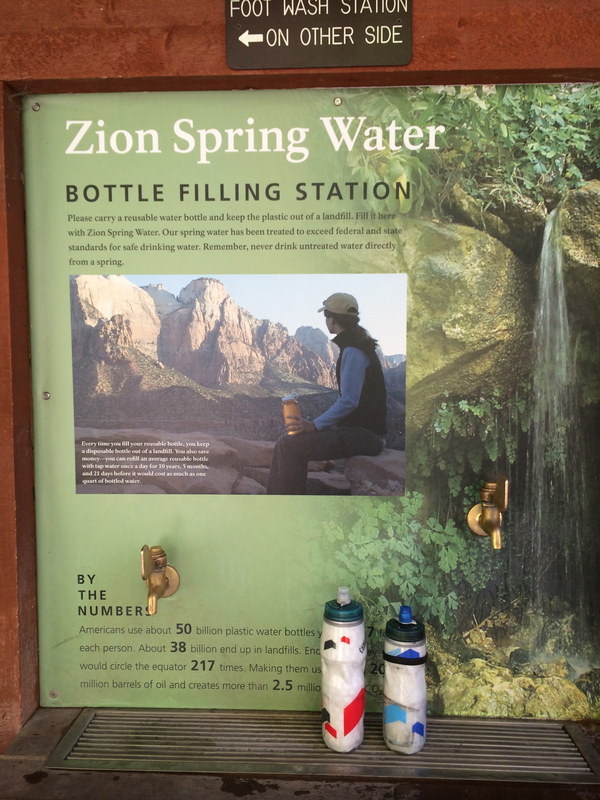 Zion Spring Water. Cold and refreshing. 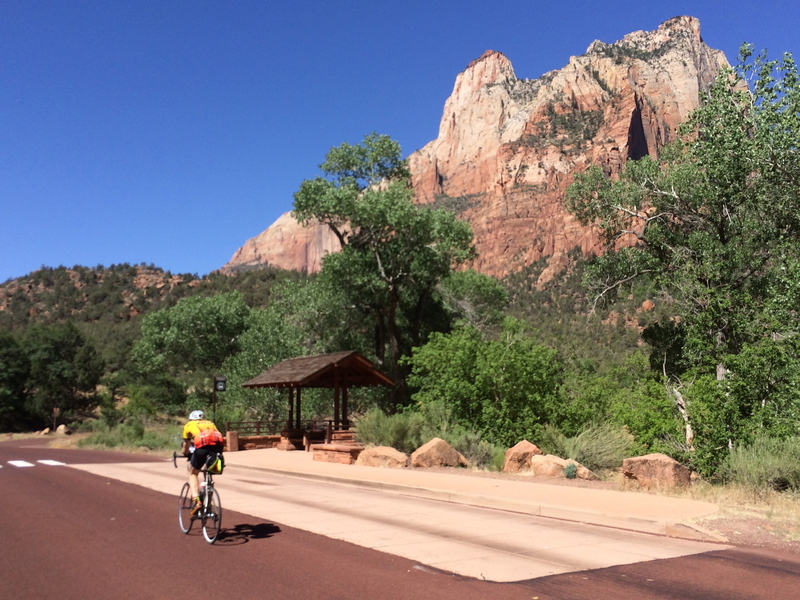 Approaching a bike path in Zion. Back in La Verkin (just north of Hurricane), where the road heads upwards to Zion, we stop for lunch at Maveriks C-store. A typical rando lunch: processed food consumed on the curb in the shade, we tank up on water and drinks because the next section has few amenities and will be hot. It is. Richard and I ride and chat about the bike industry, our products and how we came to be where we are. We have both lived in Colorado and so share stories about backcountry skiing, climbing and the outdoors. Jim, I rename the Comet. His last name is Haley (perfect), and he zips ahead of us and then fades behind, but rarely sticks with us, so we don’t form a paceline. Richard and I take turns pulling, although Richard has legs that look like Skyscrapers (his new name), and he ends up doing the majority of the work. I do what I can, reaffirming my name of Wheelsucker! This section of the ride is on and off of I-15, a major US interstate that runs to Salt Lake City. The shoulder is wide, but has rumblestrips and is pretty clean. There is an intermittent frontage road that we hop on and off of when we can. To me, it is hot. We stop and refill water bottles at Maverik C-stores every 20 miles or so and our movement up this section feels slow. We are rising in elevation and there are farms with very green fields that have been transformed out of the desert. These people know how to work the land. We pass through Cedar City and I have a quick conversation in my head with an old friend who lived and worked here at the college. PM taught literature at the small college and had a tough time of it. I am hoping for a coffee, but do not see a Starbucks and I come to find out that Mormons typically stay away from coffee or tea. No hot drinks. That makes four reasons why I could never be Mormon: 1. the chance of being a multiple wife, 2. raising more kids than the US national average of 2.1, without the aid of 3. coffee or 4. alcohol? Hello? Brutal. Carrying on. Nearing the 200 mile mark of riding we turn right to go up and over an un-named pass on Highway 20, which connects I-15 to US 89, providing access to Bryce Canyon NP, and our night’s stopover in Panguitch. 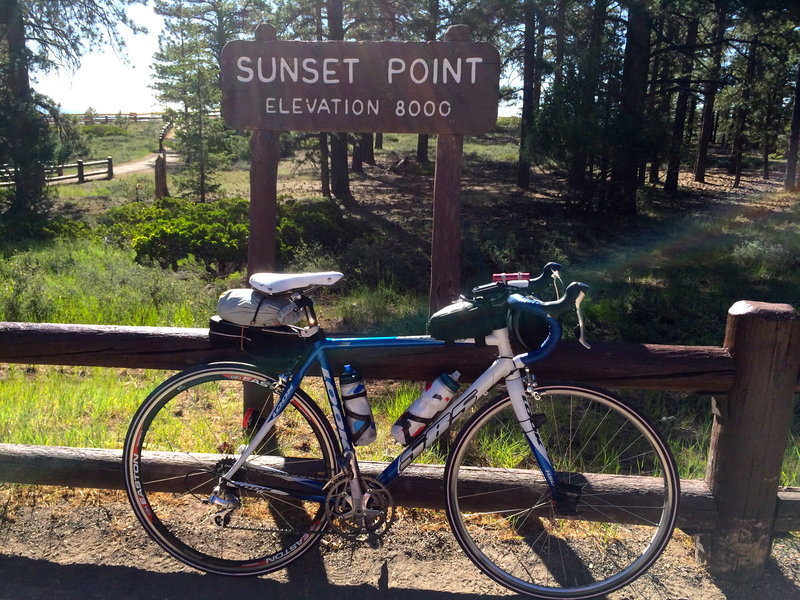 Highway 20 is 20 miles long, with 7% grades and is a 6 mile stair-stepped climb up to 7920’ in elevation. Yes, it’s a bear, but by now I am listening to music and am pedaling to a rhythm. Say, Hello hello, salamm salamm, shalom shalom, I wanna see everyone out here, jumpin! 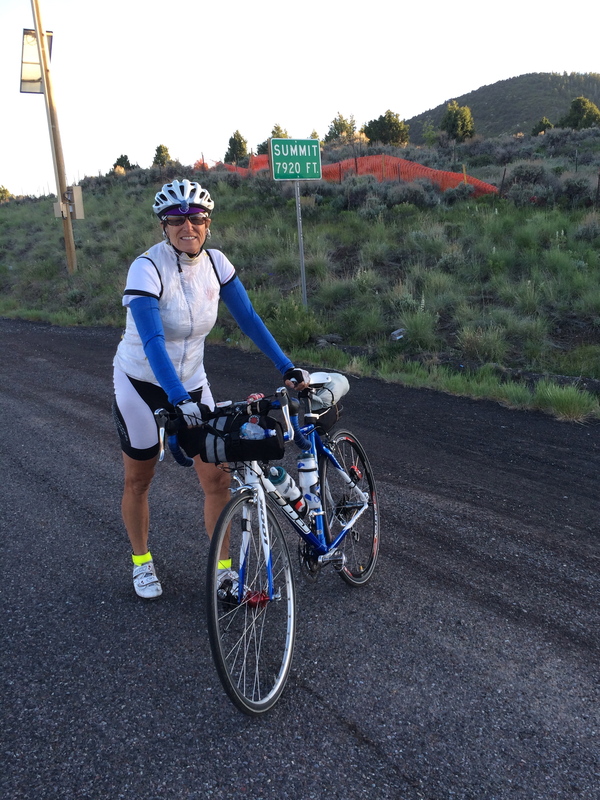 The summit of road 20 – heading to Panguitch. Richard is at the top waving us up. The descent is worthy: smooth asphalt and no traffic. The Comet and I streak down the other side. At the Junction we stop to get reflective and to put on some clothes. We ride through pockets of very cold air that startle us, so, naturally, we pick up the pace to warm up. The next 10 miles go quickly, and in no time, we are done for the day. The thriving metropolis of Panguitch, Utah: population 1600. Elevation 6600’. Open restaurants: one. Dinner ensues at the pizza joint and then we crash at the Owens Travel Center, a truck stop. Room was fine, hot shower, and the Fed-Ex package I sent myself (drop-bag of fresh clothes and stuff), was on my bed. The truck stop is above a 24 hr C-store, the only thing open early in the AM. There wasn’t however, much in the beer department and I had to make do with a Fosters…can’t have everything! Still, I am psyched! I have successfully negotiated with Jim for a 6:00 AM departure. 6:00 AM. That means I can get 6 hours of sleep. WOOHOOOOO! I have never been able to get that much sleep in one night on any long brevet. I down a couple of Advil with the Fosters to help get to sleep (I often have trouble getting to sleep during events like these, my body is too keyed up), and I want to make the most of the 6 hrs. The restorative powers of sleep; a very good thing. We head into Bryce. The Park is up on a plateau between 8-9000’ in elevation, but the beauty of the place lies in the natural amphitheaters, carved out by erosion. The main road is in a forest, and the views aren’t great. But, head off onto a side road that takes in a viewpoint and behold! 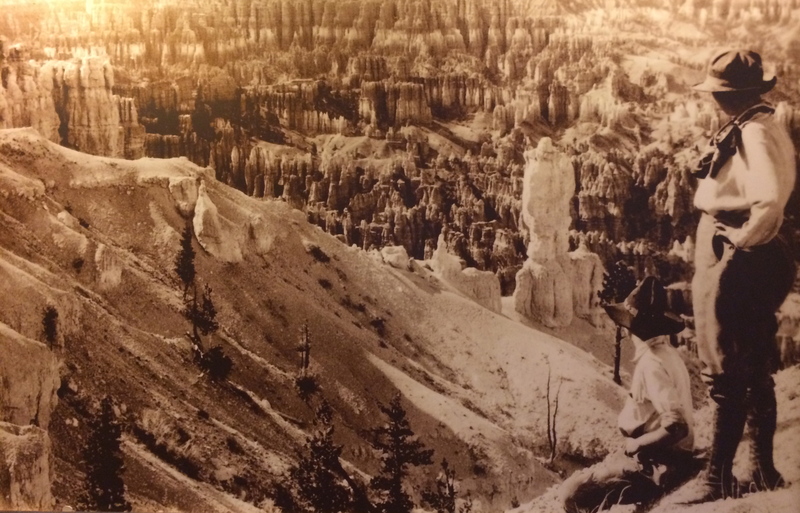 The geologic structures are called hoodoos (yes, the HooDoo500 is close to here! ), and the views are spectacular. 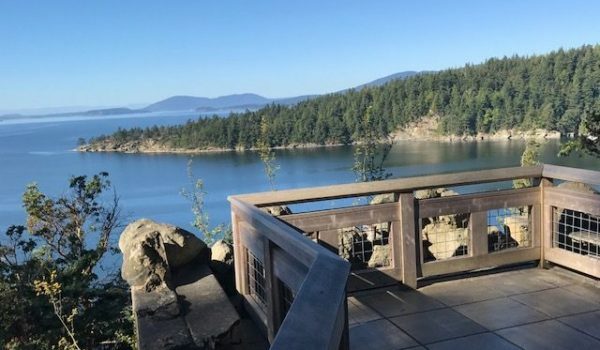 Can’t get enough of the views – Sunset point. Muppeer at Sunset Point (#Fortino!). None of us are in love with the route through here. It climbs a lot and then you turn around at a designated point in the park. And the views aren’t on the main road, so we fiddle with the route to accommodate better vistas for future riders. This takes time, and our rando math is fuzzy. We think we’ve calculated correctly, so we make our way outta the park and back to the junction. 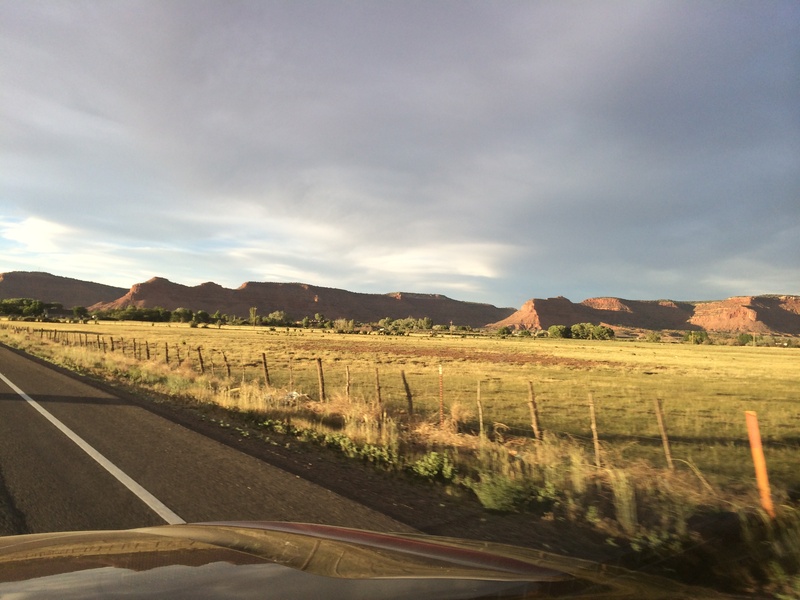 We turn back onto Highway 89 and are heading to Kanab. We have 70 miles to go and its early PM. I am feeling good about our overall progress (that 6 hours was excellent), but as in all rando events, another challenge emerges. Headwind. Right. I listen to music to help dull the pain and pass the miles. The White Cliffs. Heading to Mt. Carmel Junction. 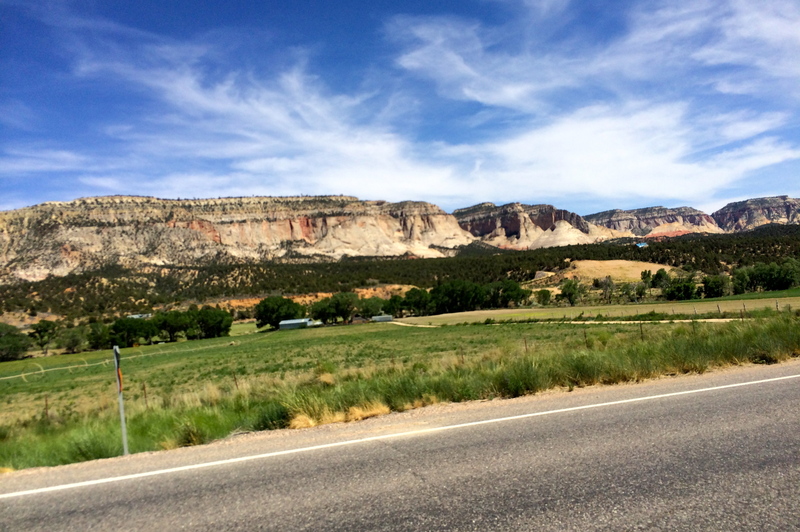 We pedal down a canyon following the Sevier River, with hot up-canyon air slowing our progress. Stopping again in Mt. Carmel Junction for ice, sandwiches and a chance to get out of the wind, I am thinking that we are getting close, but I am wrong. 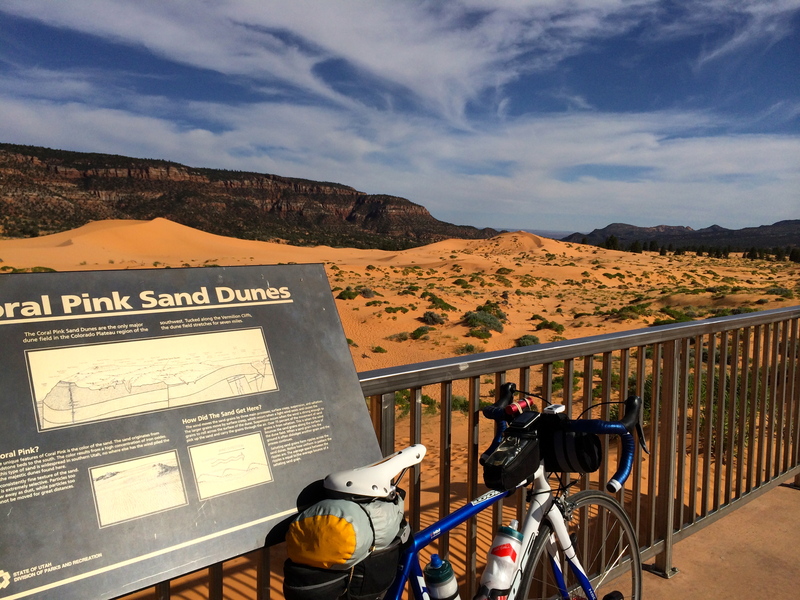 More climbing before we turn off of 89 to arrive at our final park: Coral Pink Sand Dunes State Park. Coral Pink Sands is 10 miles down Yellow Jacket road off of Highway 89 and the road surface is craptastic. The road is devoid of all traffic, which is the only good thing going, because by now, we are all a bit grumpy and are riding on our own. The road rolls along in a upward trend and I mutter to Jim that I am really ready for this to be over. He’s in a better mood than I am, but he agrees, and after what seems like hours, we arrive at the state park. The park rangers won’t allow us to go in, take a few snaps and depart without the $2.00 entrance fee, so I fork over the cash and ride up and onto an observation deck (yes, illegal, but too bad). It’s pretty cool. Apparently the red sand is formed from eroding sandstone, and it gets blown into this valley from through a notch between two mountains. The dunes are really long and I take a few snaps and from the lookout you can see the Vermillion Cliffs and if you look in just the right spot, the north rim of the Grand Canyon. You can see the Grand Canyon through that notch. Back at the Visitors center, Richard is nursing a sore toe and we are once again tanking up for the final leg to our finish. I think we must have only 10 miles, but it turns out it’s twenty. I glance at my watch and freak out. 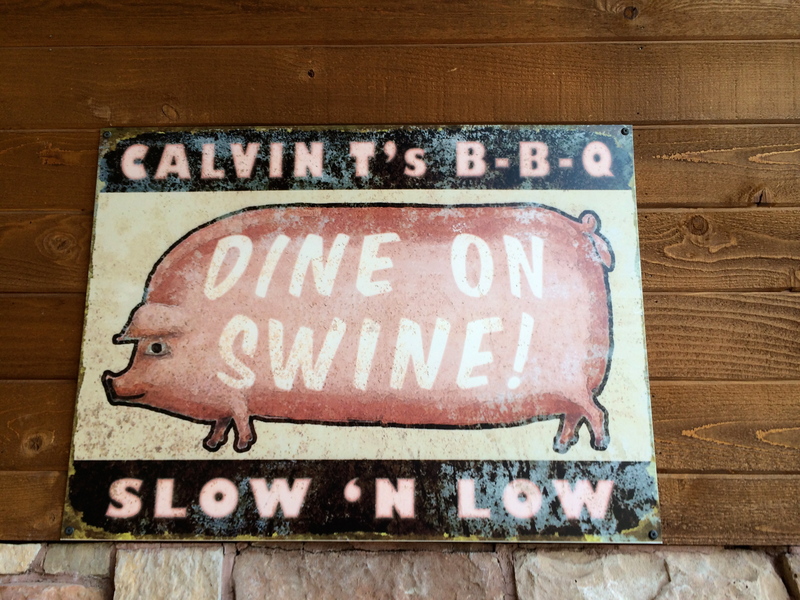 We have 2 hours to complete the ride, but we haven’t been riding 10 mph lately. We’ve slowed down from re-conn work, or the headwind, or, oh yeah, fatigue. To make matters worse, we have to backtrack 3 miles to our turnoff. I jump on my bike, yell to Richard and Jim that I’m leaving and pedal out of the park. I hate backtracking, but more than that, I hate the idea of not getting credit for a ride of this length, when I am almost at the end. That just is not going to happen. I pedal harder. Luckily, there’s a bit of a side wind and when I make the right hand turn we have a push from behind. Jim has chased me down and we ascend our last climb of the ride; a stepped 3 miler with some steeper grades. 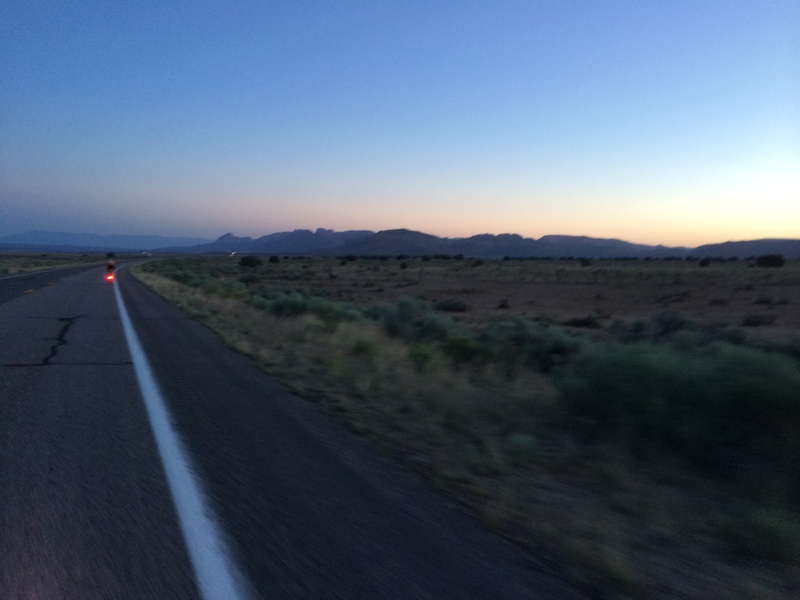 Once on top of this plateau we make time, the tail wind easily pushes us to the junction of Highway 89. 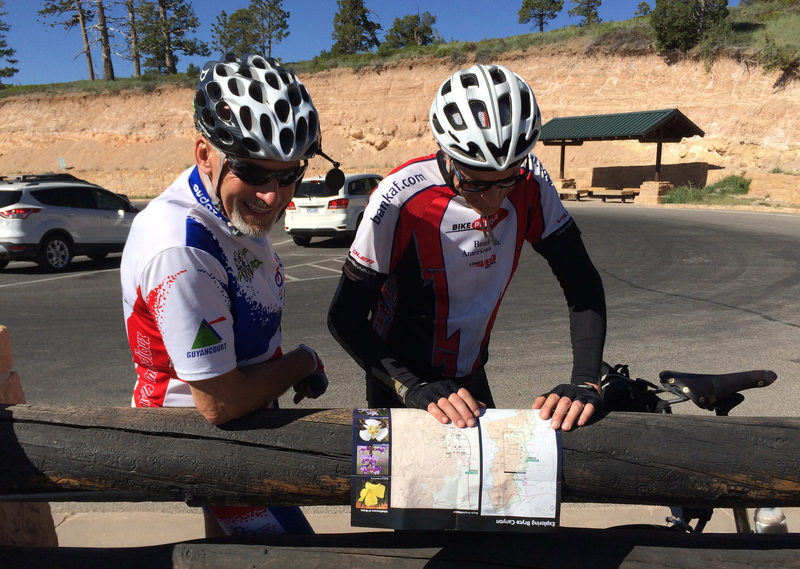 We wait for Richard who is just a bit behind us and the three of us zoom down 89 into Kanab. We get off our bikes with 57 minutes to spare. Kanab, Utah. 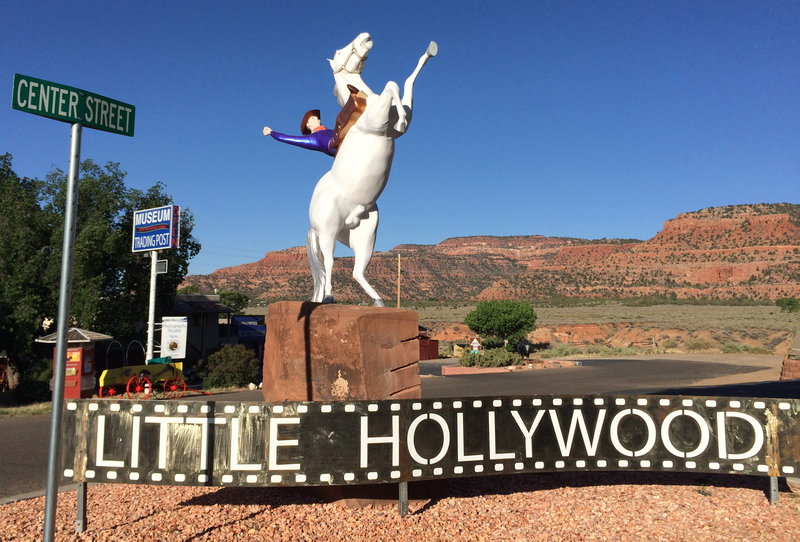 Called Little Hollywood because many early Westerns were filmed here. Shoes off, helmet too, bike in car, bike clothes stripped off in the parking lot – I can change back into regular clothes in a flash and I do. 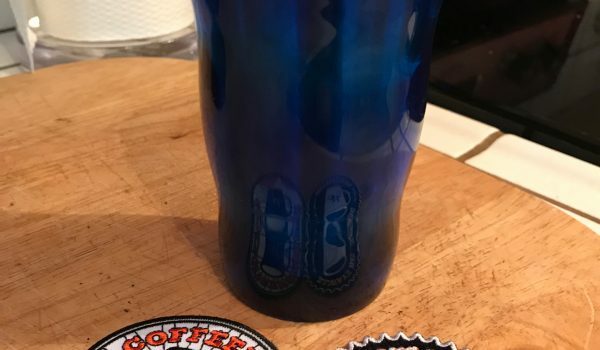 Then I open a warm-ish beer, (who cares?) and I down it. All this, before Jim has his car door open. We are both elated and reeling a bit from our final push to the finish. We decide to eat in town and then the boys take off for a 4 hour drive back to their homes closer to Salt Lake City. I get a room in town and crash. 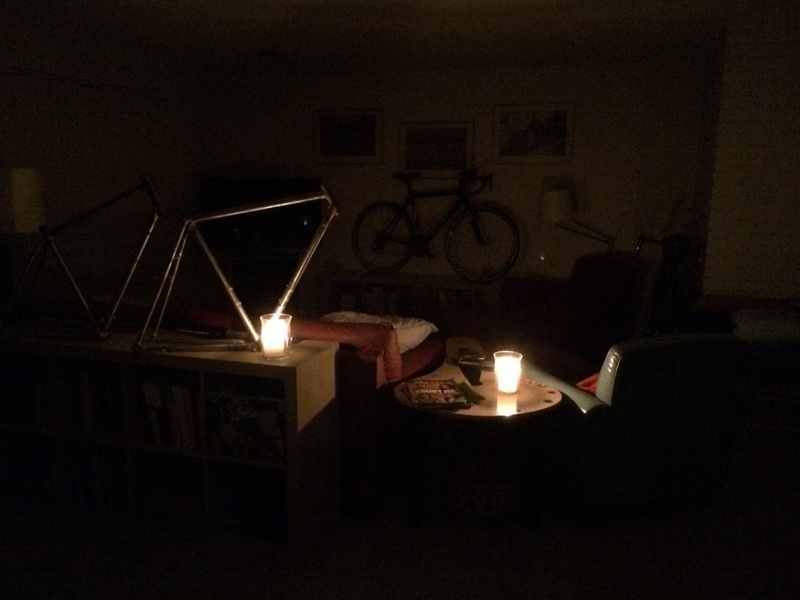 The next day, I drive another 12 hours to arrive back in Sacramento at Rivet WHQ, where the electricity has been turned off, forcing me to camp in my house. No matter, there was red wine. Many many thanks to Richard Stum for putting this awesome route together – I highly recommend it, although not in the summer. Too hot and dry! Thanks go to Jim “the Comet” Haley, and to Richard Skyscraper Stum – for their camaraderie and strength throughout our southern Utah adventure. It was great viewing such beautiful land with these two Utah locals. And always, thanks for reading. 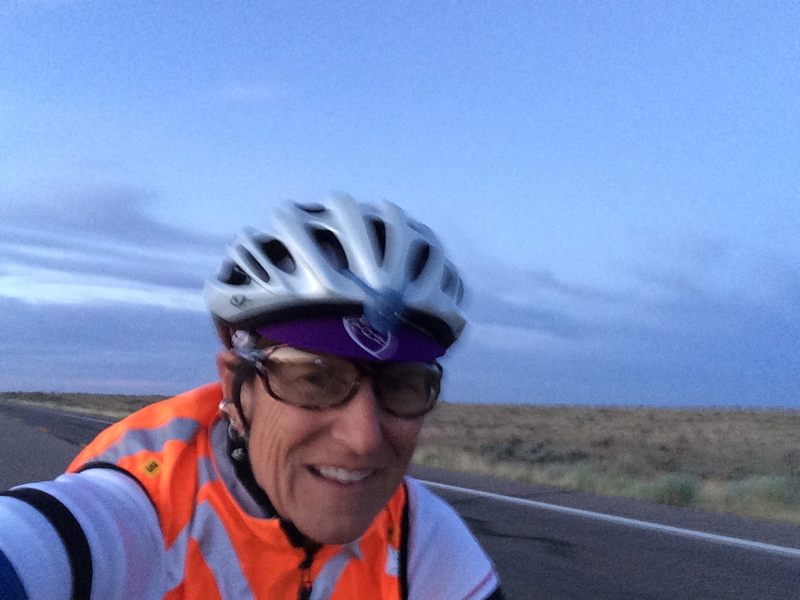 Wonderful photos and ride report of an exceptionally gorgeous ride! 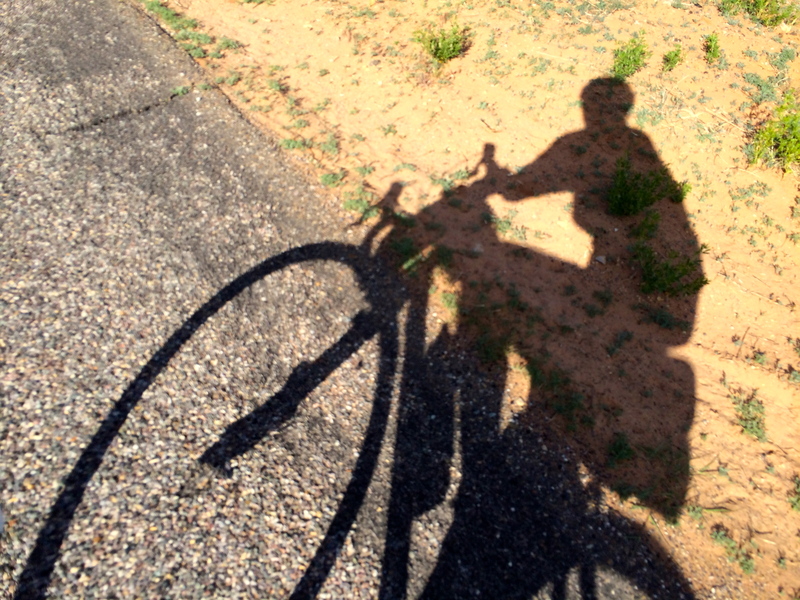 Greg and I have spent many happy hours wandering and cycling around Southern Utah. Thanks Stacy. Would love to see your pics from Panquitch! Great read, Deb. Love the photos, too! I’d love to ride that 600K in the future. Drew, the ride is right up your alley. Put it on the bucket list. 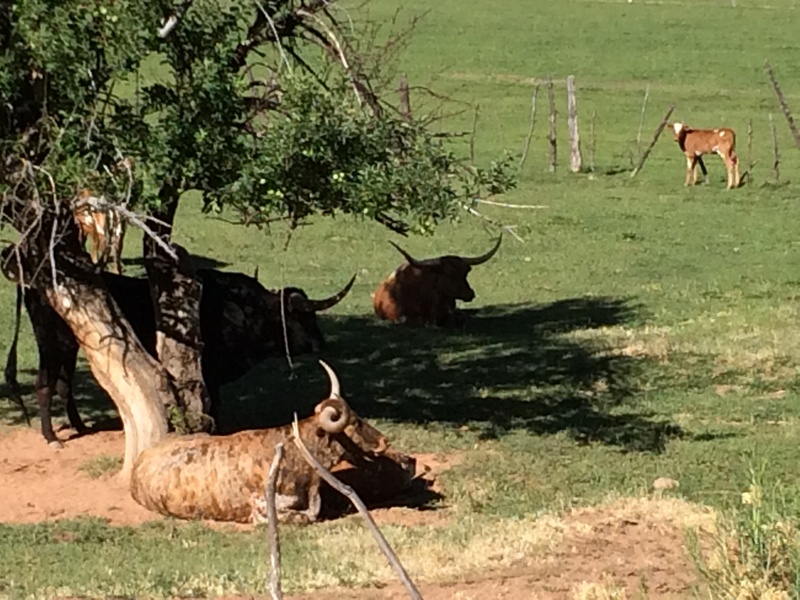 I think “Lounging Longhorn” should be my new rando name. I played football for the Longhorns in college and I don’t ride all that fast, thus I think it fits pretty well 🙂 not to mention I am 6’7″ and weigh about 260. Why was the power cut off at Rivet WHQ? What a great ride report! Thanks so much joining us out here in the Utah, the “rando flyover zone.” Your company was much appreciated on this rather grueling 600. Oh, and for the record, Mormons have not practiced polygamy for over 100 years now, so those “creepy colony’s” which we passed, are typically ex-Mormons, or people that are just doing their own thing, and are not associated with the LDS, or Mormon faith based in SLC. I may offer this same ride next spring as a ACP 600 with the option for a combo ACP 1000 + a 200 Perm tacked on the end. But then, it would be pretty much a self-supported like we did. Come and ride at your own risk! Our tiny region has no volunteers, just myself and I usually end up riding most events. What an awesome adventure! Thank you for sharing your experience!